Sorry I couldn't resist being corny, it comes so naturally. You all really seemed to enjoy it so as I purchased and used things I kept track of some recent finds to share with you today. There are affiliate links in this post. I always feel better when I'm tan, is that just me?! I stopped spray tanning unless needed for a special occasion and wanted something specifically for my face and neck since the rest of my body keeps a good color year-round. I was researching another brand and these were suggested as a good dupe. I mix a few drops with my nightly moisturizer and make sure to rub in generously, paying extra attention to spots near my forehead, ears, etc...so that it's all mixed in well. Not a fan of this powder, I was bummed because I had read good reviews. It's advertised as a long-lasting, mattifying powder that gives a fresh, poreless look. It felt cakey and very stiff on my face, I tried 2 different colors after enlisting the help of an Ulta associate and they still didn't match my skin well. I think their range of color selection needs tweaked for this product and maybe it would be a bit better. The cakey feeling of product just sitting on my face didn't feel great at all. I tried the applicator it came with, a few different powder brushes and even attempted blending it in with some other brushes and tools and it didn't make a difference. 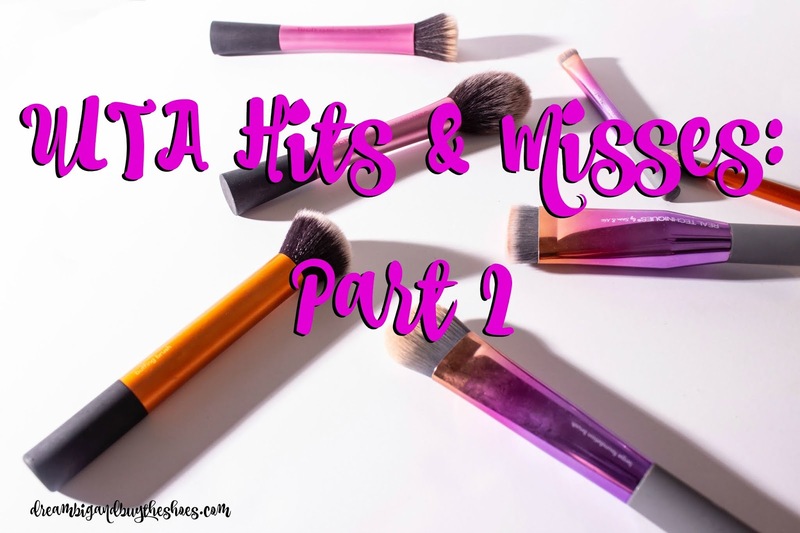 I was looking at some IT Cosmetics brushes that I've had my eye on and hoping they were part of the latest ULTA sale (some were) but one thing I can't justify spending a hefty amount of money on are makeup brushes. I began looking for dupes, and this Ultimate Blending Brush is my new favorite! For only $6 and rated at 4.5 stars on Ulta's site, I definitely recommend this one. It helps apply and blend my foundation so nicely and gets in all the tough spots while still not feeling difficult to get to. I couldn't be happier with this great buy! Once again, I was online reading beauty reviews. What can I say? I love to do this laying in bed when I can't sleep-HA! Looking for a substitute for my holy grail Estee Lauder Double Wear foundation-something that wasn't as heavy but still provided great coverage and I came across this Tarte foundation. 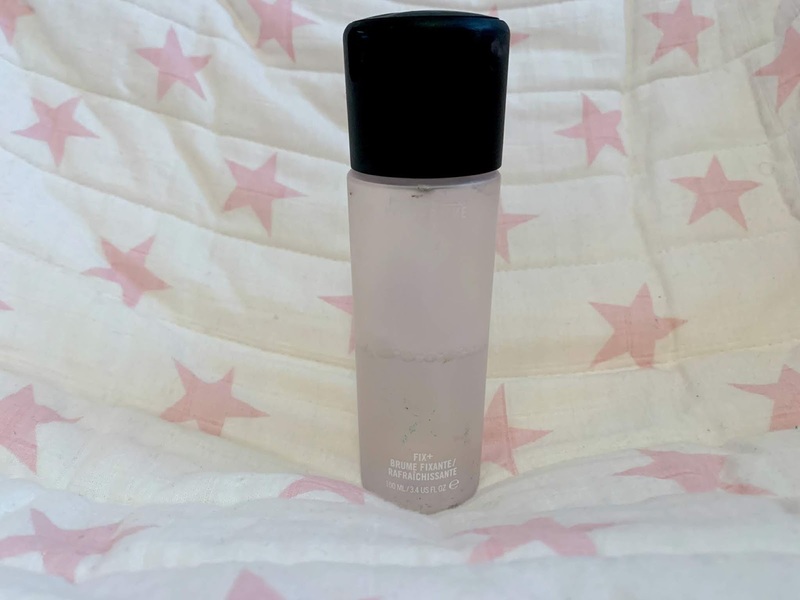 I really enjoy that it has a squeeze type of bottle to disperse the foundation, and it helps balance your complexion. I've found myself using a lot less of my IT Cosmetics Bye Bye Redness Correcting Cream which is an added bonus.The Tarte foundation is SPF15 and still considered full coverage, but doesn't feel cakey or overwhelming to me-I love that! Last but not least, another powder...but this time a winner! I love MAC products and wish we had a store close to us...then again, that may be dangerous. I ordered this online and am super pleased with the purchase. This helps control shine (my t-zone can be awful at times) and help lock in your makeup for an overall smooth look. I apply it with a medium-sized powder brush and it's been working out wonderfully! I was just at Ulta yesterday returning the Maybelline powder and picked up a new, inexpensive mascara that I'll report back on. They were also out of my lash primer so I'm trying a new formula from L'oreal. I liked it today, but also got ready super fast with a fussy toddler at my feet- so I'll give a more in depth share on my next found-up. I hope you're enjoying these beauty posts- so many of you said that you'd love to hear about everyday makeup and fashion purchases! Have you purchased anything from Ulta lately? You can shop the products mentioned in this post via the widget below or links above-thank you for your support! These posts are no longer titled "...Months with Baby Bella" because our little one is no longer a baby. We are in full blown toddler mode and life is hectic, but so much fun! 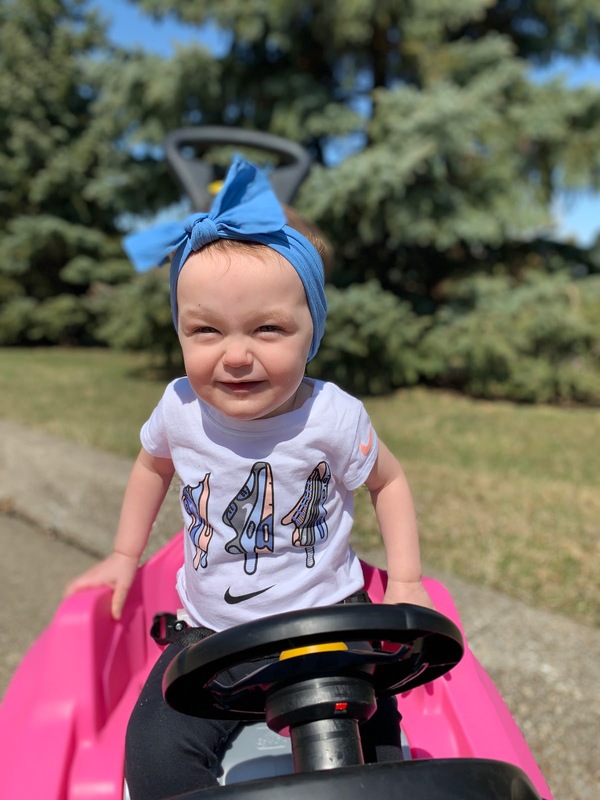 Loves: Bella is still a really happy little babe, with the exception of a few meltdowns here and there LOL Toddler fits are a real thing people! She loves music class, we did our first session since she's been able to walk the past few months and seeing her run around and interact more with the other children makes my Mama heart SO happy. Her favorite person is still Ethan, he walks in to the room and she lights up. She's been getting used to people we don't see every day thanks to FaceTime and enjoys waving and babbling to her family. 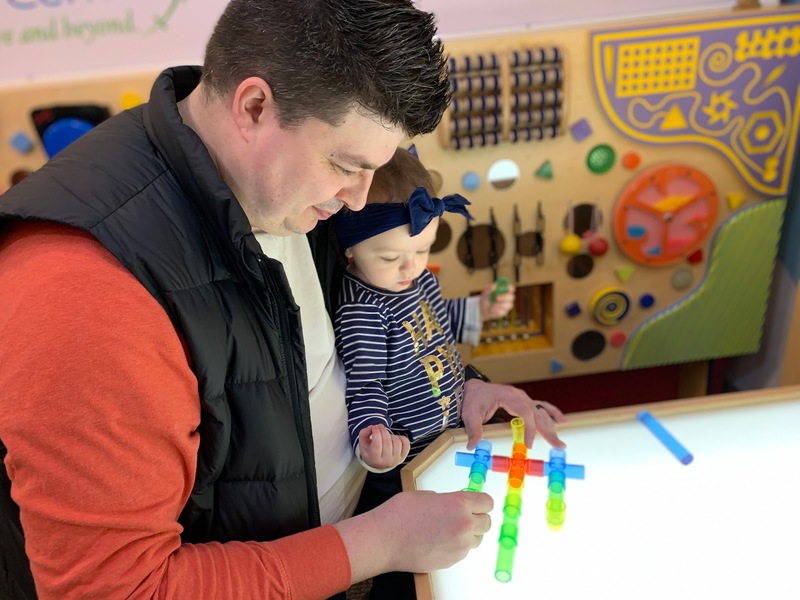 Bella LOVES water, the exhibits at the Children's Museum and the water table her Aunt got her that Chuck recently built. She has an absolute blast exploring new things and it's so much fun to watch her (and chase her around)! Not a fan of: Still hates laying down to get her diaper changed...sometimes she will lay so patiently and other times she's bouncing around, twisting and trying to stand up. Those straps on the table don't do much to hold her down ;) When she gets frustrated with something sometimes she will let out a whine and slap her knees and it's pretty silly, but part of her learning and growing and temper. Sleeping: Really well still. We have those off nights when I can tell she's getting sick or she is sick and wakes up a bit. After 3 times she comes to our bed because I get sick of walking down the hall to her room. We are blessed with a good napper and overall great sleeper! Eating: Bella will try anything, and I love that about her. She has a lot of favorites-Daddy's tuna noodle casserole, chicken parmesan, pasta of any type ;), lately she's enjoyed my sweet potato rounds. 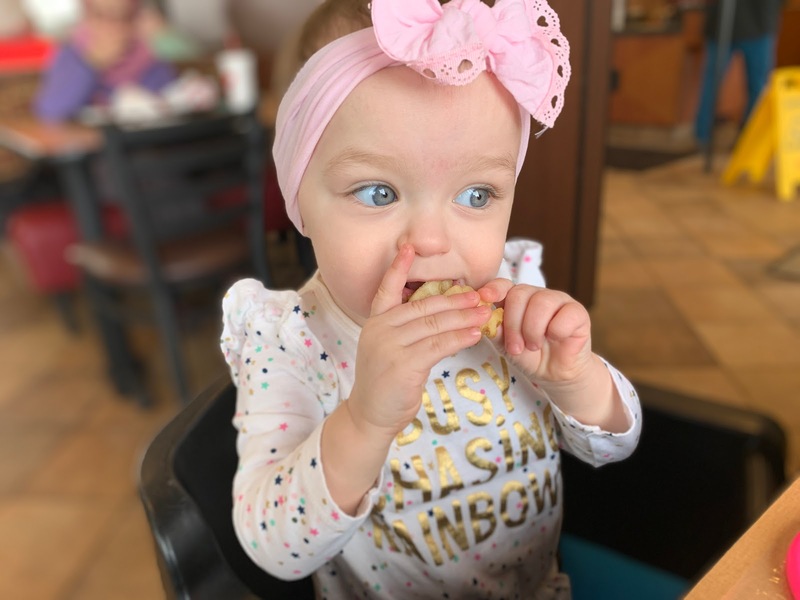 Always up for Chick-Fil-A (MY GIRL) and loves her peaches, yogurt, applesauce and the occasional sweet treat. My Grandfather gave her one of the Hershey's dark chocolate kisses and she went NUTS. It was alllll over her face and hands and she was grinning and giggling ear to ear. So now I know to keep chocolate away as much as I can hahaha! 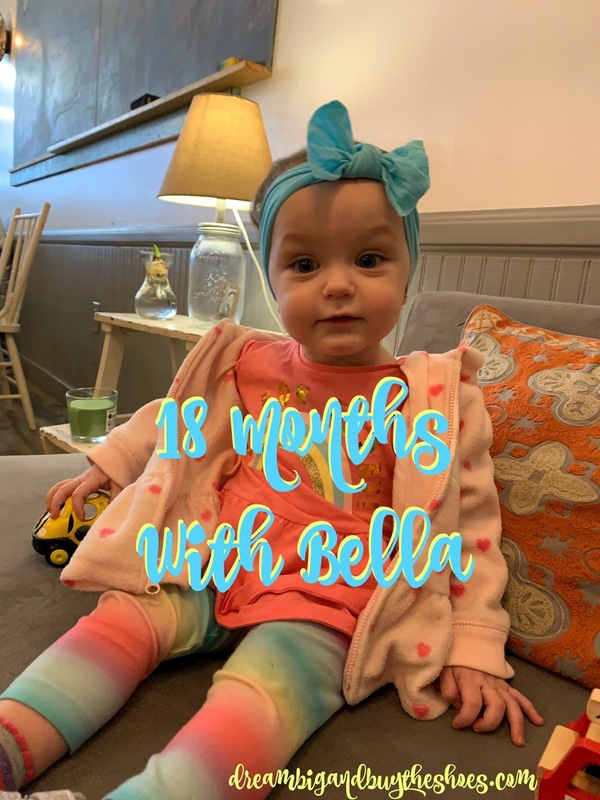 Stats: As of April 3 when she was at the doctor earlier this month- Bella is 22 lbs, 13 oz and 2 feet 10 inches tall- she's in the 95th percentile for height (GO GIRL!!!) and the 56th percentile for weight which is wonderful progress from her 4 lb 12 oz birth weight. We are so so happy with her development and progress. You would never know she was a preemie if you ask me! Overall, life with Bella Charlie is wonderful. Ethan is the BEST big brother to her and has babysat a few times when we've been gone for a few hours. The one time we were out we thought she would still be awake when we got home and it was super quiet. He had turned on her night light diffuser lamp, gave her milk, rocked her and put her to bed. WHAT?! I was amazed on how much he pays attention without leading on. Super proud parents over here :) have to brag on them when I can. snapchat selfies by Etha :) I LOVE this picture! If you've read this far, thank you and sorry-ha-ha. Bella Charlie you amaze us every day. Keep on exploring and running through the world with the excitement you do now and you will continue to live a wonderful, happy life. We love you little Mama! I was getting ready the other day and thinking about how much I love this product. I also realized that I haven't shared all the wonderful things about it, and today that changes. 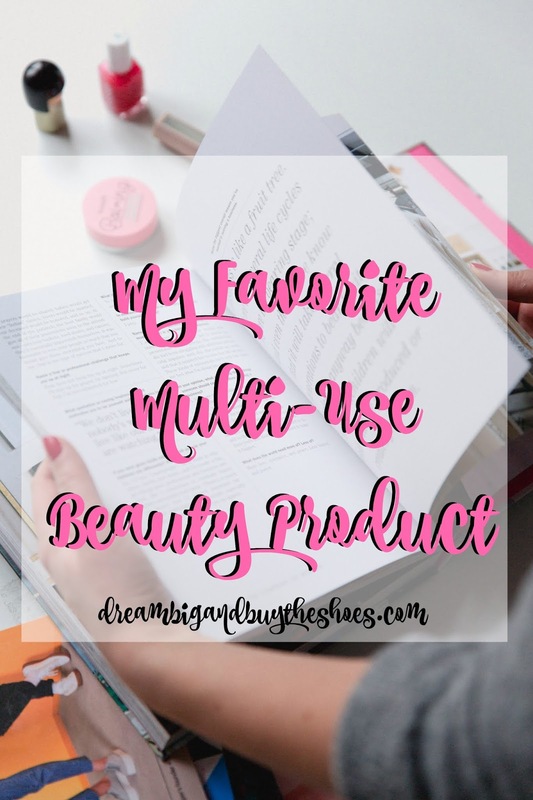 I LOVE LOVE LOVE how many uses there are for the MAC Prep & Prime Fix+ and am so excited to talk about how I use this product. There are affiliate links in this post. MAC Prep & Prime Fix + is a hydrating spray that has a variety of benefits and now comes in more than one scent. The original scent is a soothing herbal that is so refreshing- I would take it in all day if I could..there's also coconut, rose and lavender options too! The newest scent is the Cherry Blossom and it's getting rave reviews...I can't wait to smell it. It primes your face. I start my day with the MAC Fix+ by spraying 3-4 times to prep my face. The formula is filled with vitamins and minerals to help soothe and enhance your makeup. It's perfect to use before a cream based primer to help your makeup apply smoother. I have found that it helps wake my skin up and get my day started right. Sounds corny, but the scent is seriously amazing, so that helps too. It's a great refresher. Hot day have you feeling blah? Stressed out? Need a pick me up? The MAC Fix+ is heaven sent, a wonderful way to refresh the skin. Revive yourself with a few spritzes! It helps apply shadow for a more intense look. I spray a few pumps of the Fix+ on a liner brush, tap it in to my eye shadow and use it for a liner on my bottom lash line. I'm not one who any longer lines the bottom of my eyes with a black liner, but sometimes need the added boost to help me look awake. #sleepygirlproblems It also helps more glittery, metallic shadows stand out and stay in place along with the assist of an eyeshadow primer. It's great for hydration. Those Summer days where I don't need a thick moisturizer the Fix+ is my go-to for hydration. It's just enough to provide a soft sheen and prepare my face for the day's makeup. It helps your makeup LOOK better. The Fix+ is great as a setting spray, while it's not fully intended for that it does a wonderful job of locking your makeup in. I don't feel cakey after applying a full face of makeup and then a few sprays of the Fix+ after and have a nice dewey look. It helps your makeup stay all day too! It soothes your skin. Have allergies? Join the club-ha! Redness, exhaustion and allergies are no match for the Fix+. Since it's full of vitamins, minerals, green tea and cucumber it has healing properties to help soothe your skin when needed. Have you ever used the MAC prep & Prime Fix+?